Outputting your computer to your HDTV via HDMI works well. Unfortunately, your computer’s placement depends upon the length of the cable. With Google Chromecast, however, you can literally mirror any browser tab or even your desktop, from anywhere, in just a few clicks. Based on the benefits, many people just wonder that if they can stream their DVD movies from computer to HD TV via Chromecast. If Chromecast can cast your other movies from computer to HD TV, why not try to cast DVD? The reasons you are suspicious of the feasibility probably are the DVD copy protection and the incompatibility with Chromecast. What if we change DVD “disc format” to a Chromecast supported video? What is the difference between the normal MP4 video and MP4 video extracted from DVD? I don’t think they are different. What’s more, this kind of DVD Ripping is not a tough job with the help of Pavtube BDMagic. It is a integrated DVD Ripper that can remove any encryption in DVD discs and convert it to Chromecast supported MP4, AVI, MKV, FLV, MOV, VOB, 3G2, etc. It also allows you to choose audio and video codec in DVD ripping process in that Chromecast only is compatible H.264 video and AAC, MP3 audio. You can learn its other function in its review. How to convert DVD to Chromecast accepted format? Click “File” to load the DVD movies to the app. It can automatically detect the main title to convert so you don’t need to check the chapter by yourself. You can choose your desired subtitle and audio track under the chapter list. Here, you not only need to consider the supported format of Chromecast but you also should take the TV accepted format into consideration. Pavtube has optimized preset for Sony/LG/Panasonic/Samsung TV, they normal are MP4 format with the most compatible video/audio spec with the TV. If your TV is one of the brands, you can select it as the target format. On the other hand, if yours are other HD TV, you can simply choose MP4, HD MP4 in “Common Video” and “HD Video”. 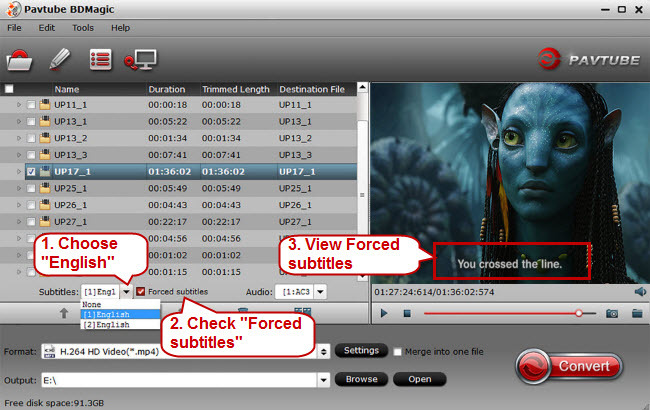 Tip: If you chose MP4 instead of the optimized preset, you can adjust video/audio parameter on your own in “Settings”. Back to the UI, hit “Convert” to begin DVD ripping process. You can locate the generated video in output folder. The setup of desktop screen sharing is very simple and straightforward. You do not need any additional software or hardware. 1.In Chrome browser, click the Google Cast button, you will see the available Chormecasr devices in your network as shown below. Cast current tab. This is the default. 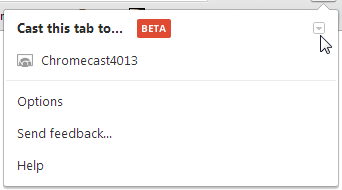 The Chromecast tab will be cast to Chromecast. Cast entire screen (experimental). 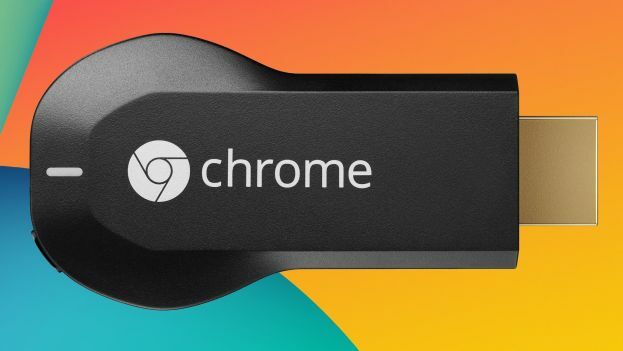 This will share the desktop screen, not just a Chromecast tab, to Chromecast. Audio mode. This will only send audio output to Chromecast. The screen or Chrome tab will not be shared. 3. 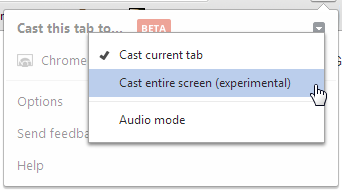 You can click “Cast entire screen (experimental)” to start the desktop screen sharing. Note: before sharing the desktop screen with the Chromecast device, there is a warning message letting you know that Google cast wants to share the screen and audio output (with Chromecast). You must click “Yes” to approve the screen sharing. 4.Once the desktop screen is shared to Chromecast, Google cast will indicate the screen is being captured and played on the Chromecast device. Once the desktop screen is shared to Chromecast, Google cast will indicate the screen is being captured and played on the Chromecast device. Now, the the desktop screen and audio is shared to Chromecast. You should be able to enjoy the ripped DVD movies on your TV.